Simple clean aesthetics in a fresh color palette are highlights of this fresh entertainment solution. Done in a lighter, medium wood tone finish with slight distressing combined with a light wax hang-up for added depth. Visual pop is provided by the woven rope pattern on the door fronts with the sleek metal hardware. With the ventilated back panel and adjustable shelves it's perfect for housing electronic components while at 64" it can accommodate most 65" to some 70" TVs. 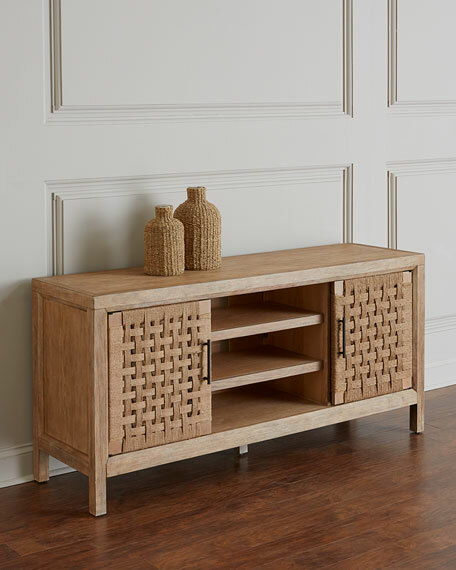 Handcrafted entertainment console with twisted rope basket weave design at door fronts. 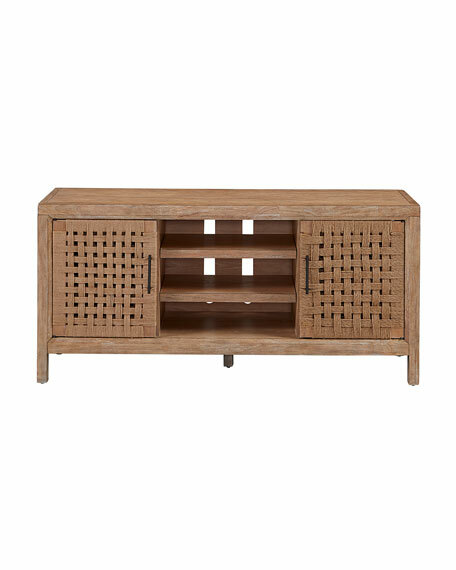 Overall, 64"W x 18"D x 30"T.
Rubberwood solids with pecan veneers. Two adjustable wood shelves in center area. Two doors, one adjustable wood shelf behind each door. Boxed weight, approximately 161 lbs.